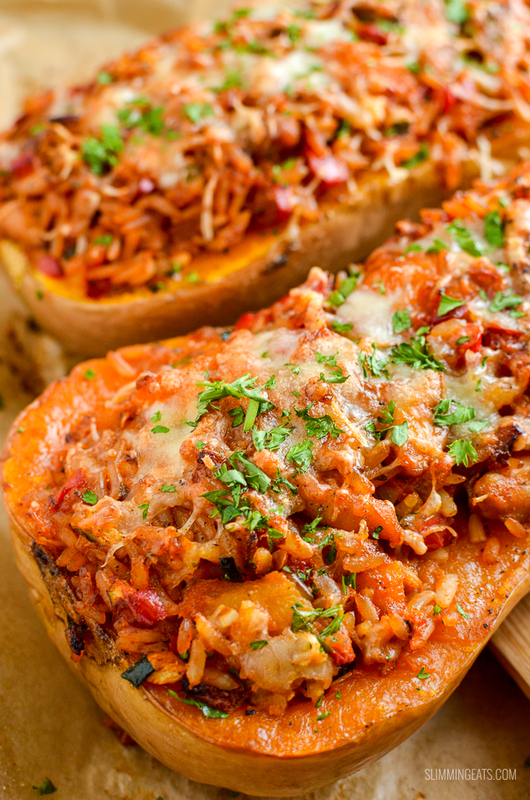 Sweet Roasted Butternut Squash Stuffed with Spicy Chicken and Rice topped with melted golden cheese – a perfect meal all in one. Butternut squash is probably one of my favourite Slimming World speed vegetable choices. It’s such a versatile ingredient and can be used in a variety of different ways. Plus because it feels quite starchy, its a great substitute for potatoes when you are doing an SP day or reducing the carbs and fancy something that feels starchy. It delicious pureed, roasted, baked, I even love it spiralled as a replacement for noodles in stir-fries. You can even make these delicious Syn Free Butternut Squash Chips and if you use one of these handy Crinkle Cut Slicers, the kids will love them too. My favourite way to cook butternut squash is roasted, I love it when you get a slight caramelization on the edges. I often dice one up and roast a big tray of butternut squash cubes with some olive oil spray, salt, black pepper and paprika, as it’s perfect for adding into salads, using as soup toppings, as a side for the main course, even with eggs and bacon for breakfast, now there is a thought. 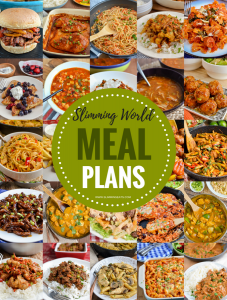 or head on over to my FULL RECIPE INDEX with over 800+ delicious Slimming World Recipes all fully searchable by meal type, ingredient, syn value. With my love of butternut squash, there wasn’t a better idea than this Roasted Butternut Squash Stuffed with Spicy Chicken and Rice. 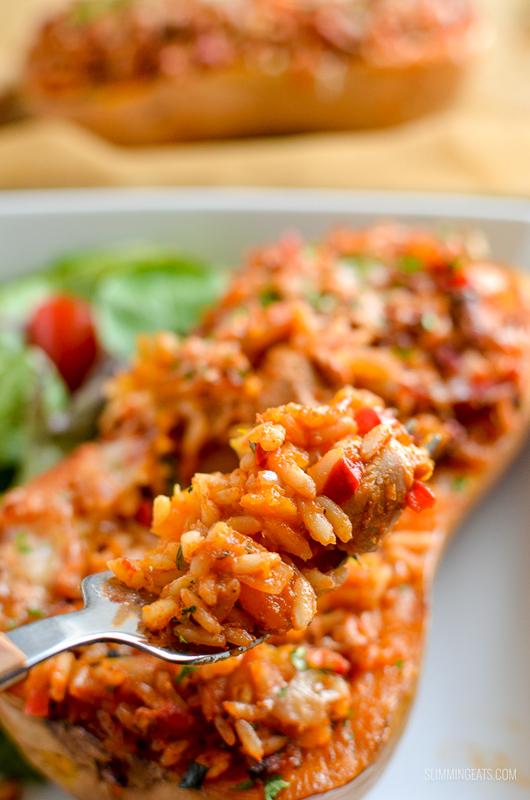 Why not use the entire butternut squash as the serving bowl for this yummy flavoured chicken and rice filling. It was just perfect. 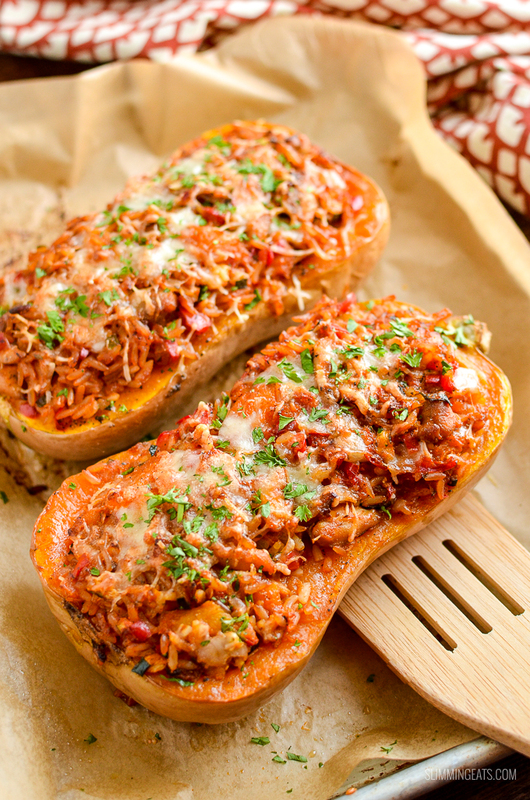 Forget baked potatoes, stuffed butternut squash is the bomb. Then of course because I had a Healthy Extra A spare, I just had to finish it off with some grated cheese. Think of the melted gooey goodness. 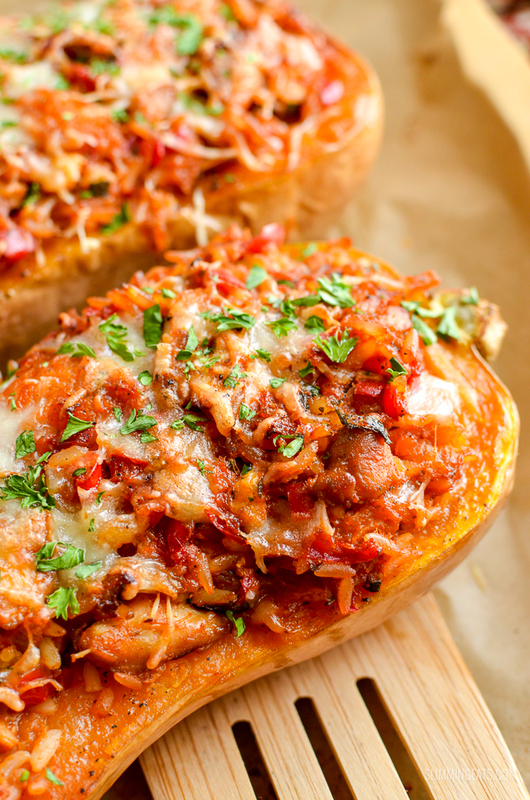 It’s like a cheesy risotto stuffed butternut squash – heavenly. 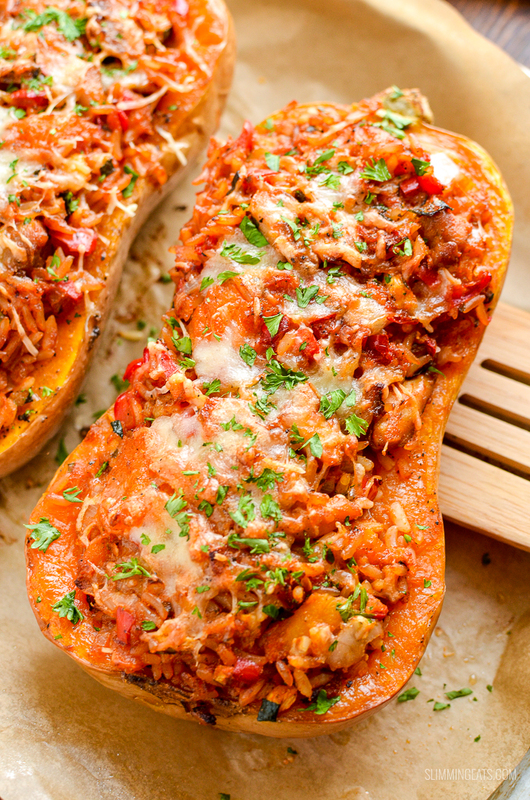 How can I add a 1/3 speed foods to this Butternut Squash Stuffed with Spicy Chicken and Rice? 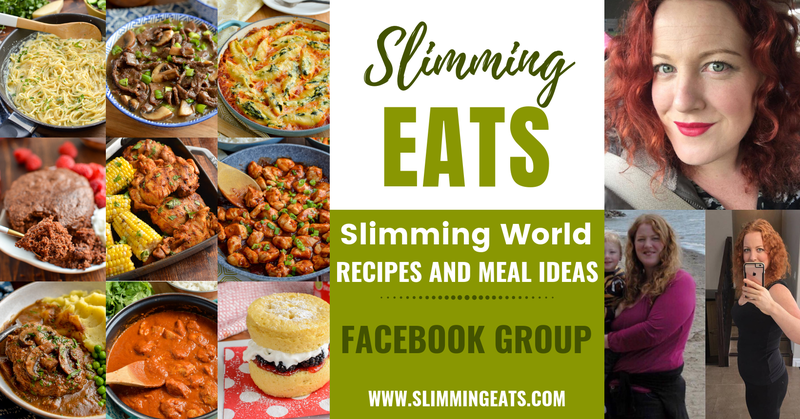 Well, you really don’t need to worry, because all the speed foods are covered in this recipe, but you can always add a nice salad to the side and well if you fancy some syn free chips (yes they are not speed), why the hell not? 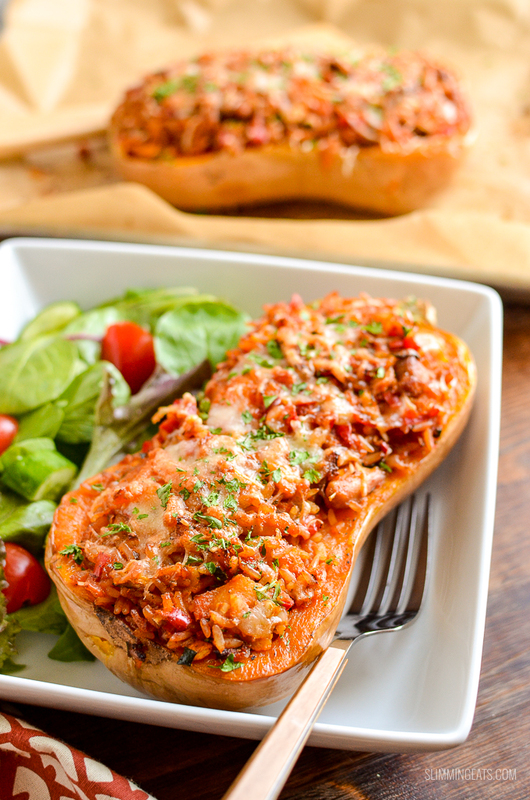 What Kitchen Items do I need to make this Butternut Squash Stuffed with Spicy Chicken and Rice? Carefully slice the butternut squash in half lengthways. Scoop out the seeds and discard. Season the squash halves with some salt and black pepper, spray with cooking oil and place flesh side down on a baking tray lined with parchment and bake in the oven until the butternut squash feel soft to the touch through the skin. Approx 30 mins. Remove and allow to cool slighting, then scoop out some of the flesh to make slightly hollow butternut squash boats. Set the butternut squash and remove flesh aside. In the meantime, spray a large frying pan or skillet with some cooking oil, add the chicken thigh and fry until lightly golden, remove and set aside. Add the onion and garlic and fry until softened. Add the courgette, red pepper and removed flesh of the squash and fry for a further few minutes. Stir in the rice, tomato paste, spices, chicken, and a little salt and black pepper and mix to evenly coat. Add the stock, bring to a boil and then reduce heat and simmer until stock has reduced down and rice is cooked. Spoon the mixture into the squash halves, top with the cheese and then return to the oven and bake for about 15-20mins until the cheese is melted and lightly golden. Serve topped with chopped coriander or parsley and enjoy. I just had this for tea, it was lovely. 🙂 thank you, can’t wait to try more. At what stage do you add the chicken back in? Just about to make it fit or tea. Looking forward to trying it. Hi Tanya – it’s added back in the with the rice. Enjoy! !